Wow! This Hey! Play! 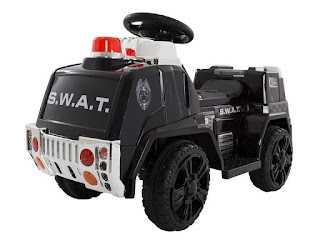 80-ZV119SWAT Swat Truck is just $69.99 (Reg. $122.83)! The Hey! Play! 80-ZV119SWAT Swat Truck is a safe, easy to operate, battery powered ride on toy that can be used on any hard, flat surface. Our cars are made from the most durable plastics allowing for an always smooth and enjoyable ride. It's a terrific way to keep kids active and will surely become your child's preferred method of transportation! Hey! Play! ride-on's offer a variety of cars, motorcycles, ATV's, go-karts and other battery-powered vehicles for children 2-6 years old. With life-like features, ease of use, and durable body construction, they provide miles of enjoyment for children. Easy to ride – the fire truck is smooth and simple to ride for your toddler or young child. Our truck is battery operated with a comfortable seat for easy riding. Charge the battery according to the included instruction manual- then simply just turn it on, press the pedal, and go! Also comes with realistic fire truck details that your future lil' rescue officer will surely love: sharp colorful fire truck decals, car sound effects, reverse ability, and headlights that turn on and off. Use it anywhere – all you need is a smooth, flat surface to have your kids on-the-go! Perfect for both outdoor and indoor playing and can easily be used on any hard, flat surface. Safe and durable – Hey! Play! makes kids toys that are not only fun but safe. All toys are safety tested, free of banned phthalates, and provides healthy exercise and plenty of fun! Made from rugged high-quality plastics that can hold up to 55 lbs. Of weight. Makes for great toys for boys and girls. Recommended ages: toddlers (18 months) – 5 years old. Product details – fire truck is completely washable and easy to clean. Usage should always be under direct supervision of an adult battery: 6v 4. 5ah, speed: 1. 5 mph, motor:18 w, dimensions: 33 x 15 x 20 inches, materials: plastic and carbon steel, adult assembly required (with instructions), color: red.